“PROPS” is the EcoClean community partner program designed to create positive change in the environment and social fabric of Austin. By partnering with local non-profit organizations each month we not only give our customers an easy way to make difference, but we spread awareness of the issues facing our community and the powerful organizations working to solve them. Each month EcoClean donates 5% of our sales every Wednesday of the month to a selected non-profit organization. We support, promote and otherwise acknowledge the programs and people that make our community strong, healthy and smart. You can make a difference by bringing in huge orders of cleaning every Wednesday! 5% of your EcoClean bill for that day will go directly to the non-profit. Austin dry cleaning will never be the same! “Our Mission: Kids in a New Groove provides Texas youth in foster care with a committed one-on-one mentoring relationship through weekly private music instruction, giving students the ability to build concrete strategies for life-long success. Any Baby Can improves the lives of children by strengthening them and their families through education, therapy and family support services. They serve a range of clients including pregnant women, at-risk families, and children with health issues, and walk the journey with these moms. Any Baby Can is a child and family resource center providing a vast array of needs to central texas children and families. Nearly 100 social workers, registered nurses, physical and occupational therapists, speech pathologists, and counselors work together to provide EVERY child a fair chance. Since 1974, Clean Water Fund has helped people campaign successfully for cleaner and safer water, cleaner air, and protection from toxic pollution in our homes, neighborhoods and workplaces. BikeTexas is the only statewide organizationt that unites all Texans who want great places to walk and bike. BikeTexas works to promote bike-friendly policies and places in our great state and across the nation. Meals on Wheels and More seeks to nourish and enrich the lives of the homebound and other people in need through programs that promote dignity and independent living. The mission of AIDS Services of Austin is to enhance the health and well-being of the community and people affected by HIV and AIDS. ASA provides direct care services to over 1,500 people and HIV prevention education to over 10,000 people in Central Texas annually. A local organization dedicated to a healthier future through early childhood health and wellness curriculum. By teaching pre-K children the ABC’s of nutrition, exercise, wellness and body awareness, HealthStart ensures a healthier future for our comminunity. AFS is a non-profit organization that promotes the appreciation of film and supports creative media production. AFS achieves its mission by exhibiting rarely seen films, providing financial support to regional filmmakers, offering film education programs to youth and adults, and attracting creative media productions to Austin and other locations throughout Texas. KOOP Radio’s mission is to support social justice through diverse programming that deals with local issues and by providing airwave access to typically under-represented communities. The Colorado River Foundation promotes educational awareness, appreciation, and stewardship of the Colorado River. CRF raises funds to support natural science education, outdoor recreation programs, annual river cleanups, and community projects that keep the public engaged in the important work of appreciating and protecting our beautiful river. APA! has played a critical role in bringing Austin the title of highest-rated no-kill city in the country. That means we are the safest city in America for domestic dogs and cats… that’s pretty cool. Thanks to the vision of Executive Director Dr. Ellen Jefferson, the staff, and thousands of passionate volunteers, APA has saved the lives of over 5000 animals in just the past year alone. Their efforts are focused almost entirely on animals placed on local Animal Centers’ euthanasia lists. APA!’s main strategies include marketing and consumer education on adoption that directly impact the no-kill rate. Expanding beyond the city limits to spread the no-kill status to all of Central Texas is their next objective and they’ll need all the help they can get. Sustainable Food Center was pushing healthy local food back when today’s new parents were still just babes in arms. Nutrition, food awareness and the idea of eating locally and in season have come a long way since then, and in Austin SFC has been leading the movement. A long time darling of Austin healthnuts and foodies, SFC is the winner of countless awards for achievement in health, nutrition, environment and social justice. 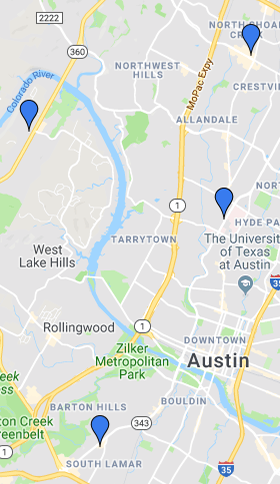 I don’t know where we’d be without them, but I do know we wouldn’t have FOUR of the GREATEST FARMERS MARKETS EVER happening every week in Austin. There is hardly a more Austin experience than a trip to a SFC Farmers market. Project Transitions was conceived in 1986 by Barbara Davis through her work with the issues of death and dying in persons with AIDS. She saw the need for a compassionate residential hospice facility where people could spend their final weeks with dignity and took action! Beginning with Doug’s House in 1989, PT has established multiple living sites and housing programs and continues to grow into their commitment to offer these services for as long as they are needed in our community. Project Transitions does not deny participation in their programs based on ability to pay—utterly beautiful! Powerful and caring individuals make it their business everyday to inspire young people to become creative, courageous, and confident leaders in their communities. At TAP!, teams of artists and educators work in partnership with schools and communities to create arts programs that explore critical issues through creative expression. TAP’s programs reach more than 16,000 young people and adults every year with more than 480 hours of programming to youth PreK-12th grade. From neighborhood and waterway clean-ups to tree planting and community garden support this group inspires Austinites everyday to take pride in our environment. The Save Our Springs Alliance (SOS) is grassroots power and Texas-sized passion at its finest! Waaaaaaay back in the early 1990s a group of Austin citizens came together to fight a huge development that threatened the Barton Springs watershed. The resulting ordinance was a historic citizen’s success story. Twenty years later SOS is still fighting to protect the water quality and natural beauty of the Hill Country springs we love. Every time you hike the greenbelt, take a refreshing dip in Barton Springs, or catch a glimpse of the tree-covered watershed that is much of southwest Austin, you might tip your hat to the S.O.S. The Save Our Springs Alliance works to protect the Edwards Aquifer, its springs and contributing streams, and the natural and cultural heritage of the Hill Country region and its watersheds, with special emphasis on Barton Springs. If you are new to Austin or too young to remember, check out this Chronicle Award to understand the enormous impact this organization has had on the quality of life we Austinites enjoy. Austin Lyric Opera has been enriching Austin with critically acclaimed operatic productions and opera education for 25 years. SafePlace is an Austin based nonprofit organization ending sexual and domestic violence through safety, healing, prevention and social change. For over 35 years the staff, volunteers and generous supporters of SafePlace have worked passionately to help thousands of victims of sexual and domestic violence each year in central Texas. HCC was founded in 1999 to preserve – forever – large strategic natural areas that conserve critical water features, preserve outdoor recreation opportunities, and help maintain the Hill Country’s unique quality of life. Their philosophy is simple. Once Hill Country land is gone, it’s gone for good. When HCC preserves it, it’s here forever.